In the case Ex Parte Crow Dog, decided by the U.S. Supreme Court in December 1883, the Court ruled that despite explicit extension of U.S. jurisdiction over “certain bands of Sioux Indians” in 1877, they were subject to U.S. law not as citizens entitled to equal protection under the law and the rights guaranteed by the U.S. Constitution, but as “wards subject to a guardian … as a dependent community who were in a state of pupilage.” The Supreme Court ruled that Crow Dog’s actions in killing Spotted Tail remained under tribal jurisdiction. In his September 1972 article in the North Dakota Law Review, “Tribal injustice: the Red Lake court of Indian offenses,” Press/ON publisher William J. Lawrence chronicled the United States’ establishment of courts of Indian offenses, and examined the Indian court at Red Lake. Lawrence scrutinized the courts of Indian offenses’ shaky legal foundation, resting on U.S. v. Clapox—“mere educational and disciplinary instrumentalities” deriving their authority from U.S. ‘guardianship.’ He noted that another “defense of their legality” is the doctrine, espoused in 1934, that courts of Indian offenses “derive their authority from the tribe rather than from Washington.” Lawrence adds, “whichever of these explanations is offered for the existence of the courts of Indian offenses, their establishment cannot be held to have destroyed or limited the powers” vested in the people. 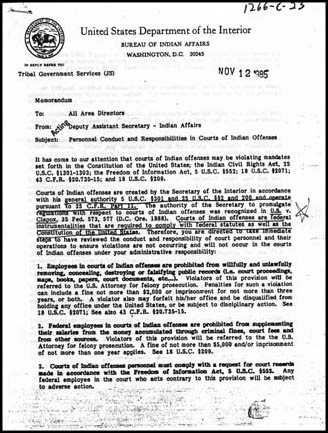 The year in which tribal authority—rather than the authority of the U.S. government—was held to legitimate Indian courts is significant: 1934. Following years of lobbying by the Bureau of Indian Affairs, led by “reformer” and Indian Commissioner John Collier, the U.S. Congress enacted the Indian reorganization Act (I.R.A.) in 1934. The authority of Indian tribal courts was challenged in 1956 in case involving adultery: Iron Crow v. Oglala Sioux Tribe of Pine Ridge Reservation, heard by the U.S. Court of Appeals, Eighth Circuit. In that case, Marie Little Finger and David Black Cat were tried and convicted in the Oglala Sioux Tribal court of the crime of adultery, under the Revised Code of the Oglala Sioux Tribe. The Tribal Court exercised jurisdiction on the grounds that both Little Finger and Black Cat were enrolled members of the Oglala Sioux Tribe, and that their tryst took place on the Pine Ridge Reservation. Little Finger and Black Cat filed for an injunction in federal court, on the grounds that the Tribal Court did not have the jurisdiction to try and convict them, and that enforcement of the sentences of the Tribal Court was in violation of the due process clause of the Fifth Amendment to the U.S. Constitution. The U.S. appellate court found that Tribal Courts are not provided for in either the U.S. Constitution, nor have they been “authorized by federal legislative action.” However, the federal court ruled that since Congress had provided for “pay and other expenses of judges of Indian courts” and Indian police, Congress “recognized” the authority of Indian tribal courts, and that those courts had “inherent” jurisdiction. 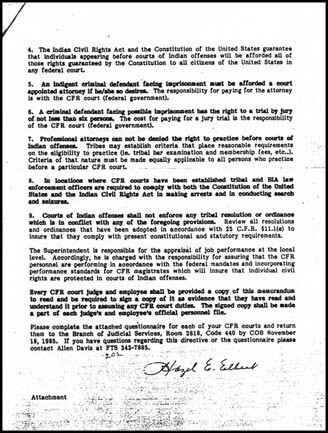 Based on the due process clauses of the U.S. Constitution, Mrs. Colliflower then petitioned for a writ of habeas corpus, claiming “that her confinement is illegal and in violation of her constitutional rights, because she was not afforded the right to counsel, was not afforded any trial, was not confronted by any witnesses against her, and because the action of the court was taken summarily and arbitrarily, and without just cause.” The district court decided that it did not have the jurisdiction to issue a writ of habeas corpus for an Indian who was committed by a tribal court. Mrs. Colliflower appealed; the federal appellate court ruled on the jurisdictional issue but did not rule on the petition for a writ of habeas corpus.